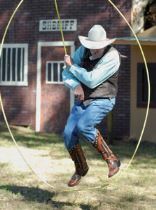 Cowboy-related events at the Booth Western Art Museum in Cartersville, Georgia, keep Western traditions alive. Two relatively new museums in Cartersville, Georgia, take visitors to the American West and beyond. Several generations of Americans were raised on stories about the Western cowboy. From the days of the silent movies to the radio and television eras, there always has been someone to portray him: Tom Mix, Guy Madison, Johnny Mack Brown, Bob Steele, Lash LaRue, Roy Rogers, Gene Autry, and so on. Artists, too, have depicted the West and all its inhabitants in their paintings, sculpture, and other media. You can feel as though you have returned to those Wild West days by stopping along Interstate 75 northwest of Atlanta, Georgia, in little Cartersville. There lies a modern and extremely well-funded Western art museum that rivals the likes of Woolaroc in Bartlesville, Oklahoma; the C.M. Russell Museum in Great Falls, Montana; the Buffalo Bill Historical Center in Cody, Wyoming; and even the Autry National Center in Los Angeles. Although the Booth Western Art Museum lies hundreds of miles to the east of what is typically considered to be the American West, it boasts a collection of original Western art that equals all other collections. It’s a perfect stop for motorhomers traveling to or from Perry, Georgia, for FMCA’s 85th Family Reunion & Motorhome Showcase, March 14 through 17. And it’s the only museum of its kind in the southeastern United States. Upon learning about this relatively new museum, which opened in 2003, the next question you may have is, “Why is a trophy collection of Western Art in Georgia?” Basically, the answer is because donors decided to build it there. The museum is made up of collections from several anonymous individuals who collected original Western art during the last several decades. They consolidated their huge collections and had a 120,000-square-foot multi-story structure built on 5 acres to accommodate items. The museum was named after Sam Booth, who served as a mentor to several of the founders. It’s similar to what Frank Phillips (the petroleum magnate) did with his collection of Western art that today is open to the public at Woolaroc. The Booth is different, however. In addition to six permanent galleries of Western art “” which also include historical artifacts “” it also features Civil War art, as well as presidential letters and portraits. It’s a prize stop for history lovers. The presidential section contains original letters “” letters that may or may not have been written while that particular commander in chief was serving in office. For example, the Theodore Roosevelt original letter has to do with the recommendation (or in this case, a non-recommendation) of a certain individual who was seeking a job. The Civil War art exhibit is a true bonanza for those seeking to expand their appreciation of this part of American history. Paintings depicting various battles and events are arranged in chronological order, so visitors can follow events as they occurred. The permanent Western art exhibit includes the creations of 200 artists whose work spans a century and a half. Galleries are called The American West; The Cowboy; Faces of the West; Heading West (which includes stagecoaches and covered wagons); and the Modern West. In addition, the two-story Sculpture Court features traditional and contemporary pieces. Art is regularly rotated into and out of the permanent Western exhibit, so you can visit again another time and expect to see something different. Temporary exhibit galleries hold a variety of changing major exhibits. If you visit in March 2011, you will be able to see impressive black-and-white nature photos taken by Kevin Nickell, and abstract art by Ed Mell depicting the West in a different way. Starting March 29, the Civil War art of Mort Kunstler, which includes 40 major paintings, plus sketches, photographs, artifacts, and other objects, will be available for viewing. When you visit, be sure to start at the Orientation Theater, where you can see The American West, a 15-minute film. And after viewing the galleries, you can have a snack at the café and peruse the museum store for Western-oriented mementos. The Booth Western Art Museum is off Interstate 75, exit 288. From there, go west on Main Street. Follow Main Street 2.2 miles and turn right on Gilmer Street. Go two blocks and the museum is on the left. Parking is available in the Tabernacle Church parking lot on the right side of the street. Museum admission is $10 for adults, $8 for seniors, $7 for students, and free for children 12 and under. The museum is open Tuesday, Wednesday, Friday, and Saturday from 10:00 a.m. to 5:00 p.m.; Thursday from 10:00 a.m. to 8:00 p.m.; and Sunday from 1:00 p.m. to 5:00 p.m. It is closed on Mondays. For more information, visit http://www.boothmuseum.org/ or call (770) 387-1300. The Booth would be reason enough to visit Cartersville, but this small city hosts another high-quality museum as well: the Tellus Science Museum, which opened in 2009. This facility features 120,000 square feet of interior display and exhibit area, and it also has more than sufficient parking for even the largest motorhomes. The Tellus is located on a site that was home to the Weinman Mineral Museum for 20 years. It’s a significant expansion on the site “” now a science museum designed for the entire family. In fact, it has four huge exhibit galleries and a planetarium. The Weinman Mineral Gallery features not just gems and minerals from around the world, but it puts the visitor in touch with the rich mining history of Georgia and the southeast United States. The Science in Motion Gallery provides a well-chronicled timeline of motorized transportation that takes the visitor from the beginning days of the internal combustion engine and the automobile up to the electric car. Motorcycles and airplanes “” including a replica of a Wright Brothers’ aircraft “” as well as rockets and interplanetary space exploration are considered. The Fossil Gallery presents a huge collection of bones and fossils from dinosaurs (Tyrannosaurus rex) and fish (a giant shark called a Megaladon) that date back millions of years. The fourth gallery is called the Collins Family My Big Backyard, which is especially fun for kids. It offers hands-on activities and play that let everyone learn about light, sound, magnetism, and more. Everyone will want to go inside the walk-in tree, which teaches visitors about the weather. The planetarium features different movies that are presented on a rotating schedule. A small extra fee is charged (in addition to admission fees). The films are shown on a huge dome-shaped screen. Every day a live show is offered during which visitors learn how to view the night sky and identify stars, constellations, and planets. This is done by projecting an image of the night sky for that evening, and then pointing out the stars and constellations. Other fun museum activities include a fossil and gem digging area, where kids can keep what they find. Also, you can tour the Solar Decathlon House, constructed by architectural and engineering experts from Georgia Tech, which is designed to be self-sufficient from an energy usage standpoint. It is open from 1:00 p.m. to 4:00 p.m. Thursday through Sunday. There is no extra fee for either of these activities. Tellus Science Museum is located just west of I-75 at exit 293. Admission is $12 for adults, $10 for seniors, and $8 for children ages 3 to 17. The museum is open daily from 10:00 a.m. to 5:00 p.m. For more information, visit http://www.tellusmuseum.org/ or call (770) 606-5700. Stop in Cartersville and you will be amazed at how much you can see in small-town Georgia. And how much you can learn. The following is not a complete list. Please check your campground directory or the RV Marketplace, published online at FMCA.com and in the January and June issues of FMC magazine, for additional listings.